I think it’s a universal thing – the love for potatoes! Isn’t it? You add it to cauliflower, you get aloo gobi. You add it to beans you get aloo beans and you add it to spinach you get aloo palak [aloo=potatoes, palak=spinach]. 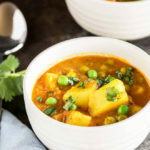 I often make aloo based sabzi (potato based Indian style dish) when I want something comforting and easy. 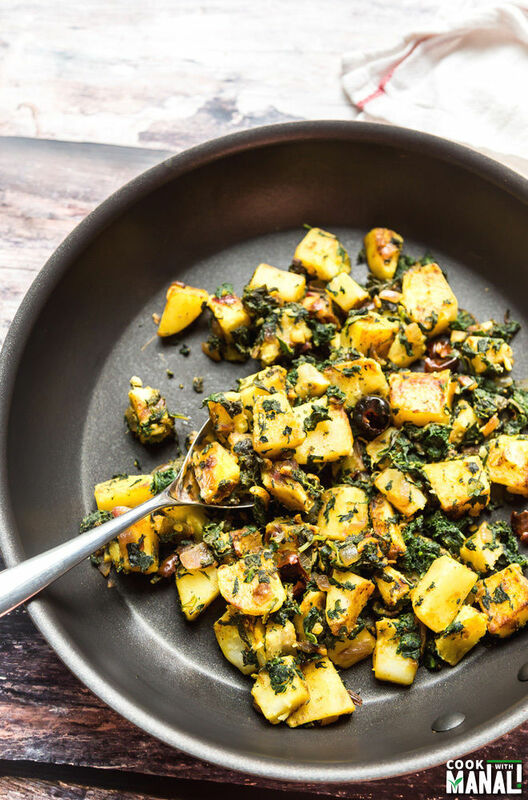 This Aloo Palak is one of my personal favorites. My mom used to make it a lot during winters when we would get really good fresh spinach in the market. In fact potatoes with any greens would be a constant feature on our table during winters. I have always enjoyed my greens and this aloo palak is something I make often. Aloo palak can be made in a number of ways. 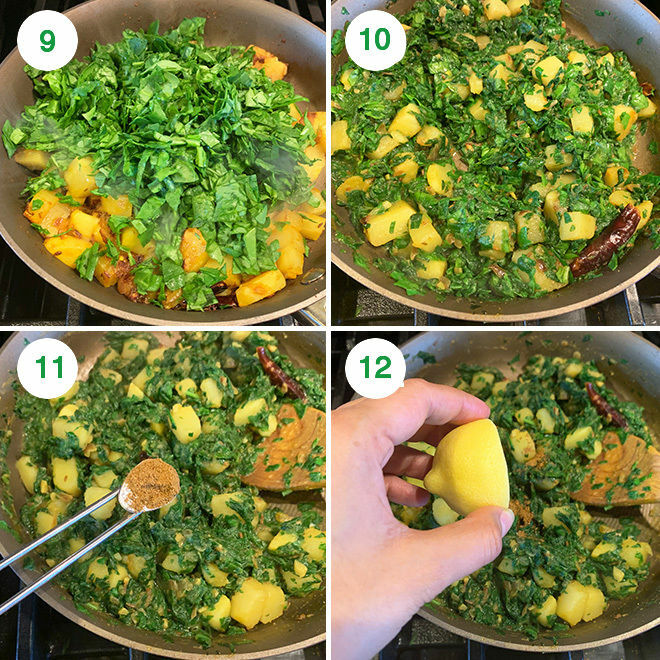 I also make it in several ways, sometimes I add water to the spinach and make it like a curry and then add potatoes to it, like in this Instant Pot version. The version I’m sharing today is a dry version of aloo palak. 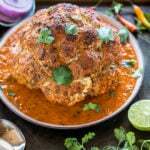 It comes together quickly and what I like most about this recipe is that it uses simple spices and ingredients. This recipe in a way is a reflection of what I grew up eating. Such simple sabzi like this aloo palak, dal and roti used to be my lunch and dinner every single day. ✓ great way to eat the greens in season! ✓ goes well with simple roti and dal – my favorite way to eat it! I have used a lot of spinach in this recipe. It’s practically loaded with spinach. If that’s too much for you or you are more of a potato fan, just cut down on the spinach. I don’t miss a chance to load up on the greens whenever I can. So, for me this was perfect. And my mom made it in the same way too. I guess moms never want to miss a chance to feed their kids as much greens as they can. Right? Make sure to finely chop the spinach for this recipe. Yes, it would take some time but It tastes so much better that way. You may use your food processor to speed things up. I usually stick to chopping by hand. I also chop the potatoes pretty small for this recipe. This way they cook fast and also taste good with the spinach. 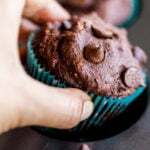 So, do chop them to ½ inch or smaller pieces. This way they would cook in 5 to 6 minutes. Like I said before, the spices are very minimal in the recipe – just some coriander powder, turmeric and red chili powder. I add a bit of garam masala on top at the end but you can skip it to make it even simpler. The version that was made in my house often had no spices to it. It would just be a tadka of cumin seeds or fenugreek seeds with garlic and dried red chilies. And that was about it. 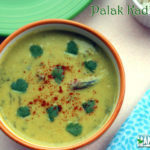 There was nothing else added to the simple aloo palak ki sabzi at my home. Hope you guys enjoy this simple Indian recipe from my kitchen! 1- Heat oil in a large pan on medium heat. Once the oil is hot, add the cumin seeds and let them sizzle for few seconds. 2- Then add hing, chopped garlic and dried red chilies. Break the dried red chilies before adding to the pan for more heat. 3- Cook for 1 minutes until the garlic starts changing color. Then add the chopped onion. 4- Cook the onion for around 3 minutes until soft and translucent. 5- Stir in the chopped potatoes and mix. 6- Add turmeric, coriander, red chili powder, salt along with 3 tablespoons water. 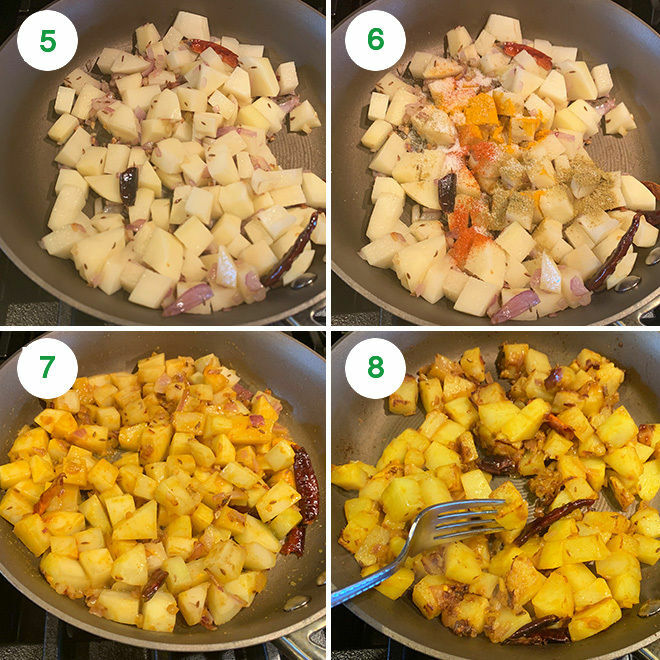 7- Toss to combine until all the potatoes are well coated with the masala. 8- Close the pan with a lid and let potatoes cook for 6 to 7 minutes until almost done on medium heat. Open lid and stir every 2 minutes or so. 9- Start adding the chopped spinach slowly. 10- Stir after each addition until the leaves. wilt. Cook for 3 to 4 minutes after adding all the spinach. 11- Add garam masala and mix. You may skip the garam masala here if you want to keep it super simple. 12- Squeeze in lemon juice and mix. There shouldn’t be any water left at this point. 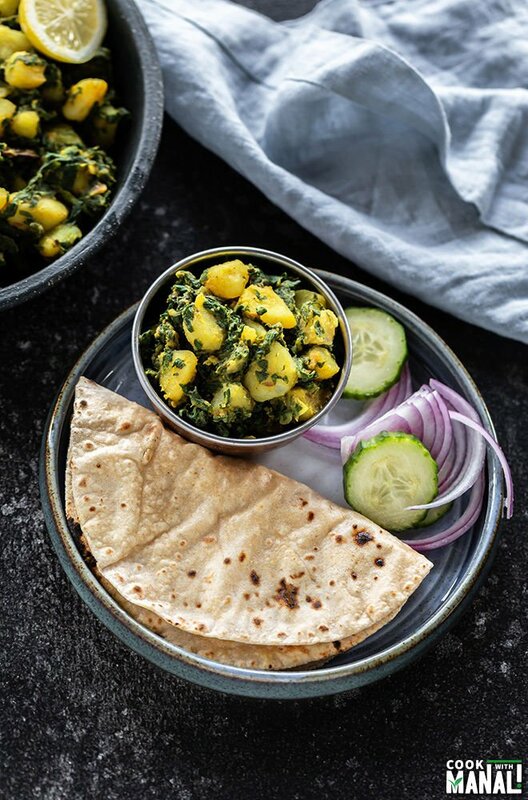 Serve aloo palak with a side of roti. 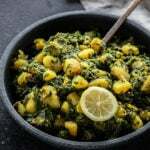 If you’ve tried this Aloo Palak Recipe then don’t forget to rate the recipe! You can also follow me on Facebook and Instagram to see what’s latest in my kitchen! 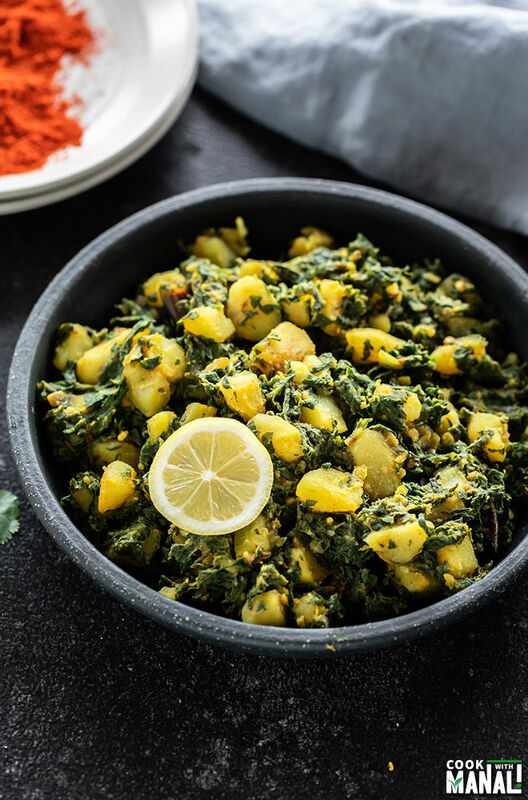 Healthy and vegan, Aloo Palak is a super simple Indian style stir-fry where potatoes and spinach are cooked together with minimal spices! Tastes great with any flat-bread! Heat oil in a large pan on medium heat. 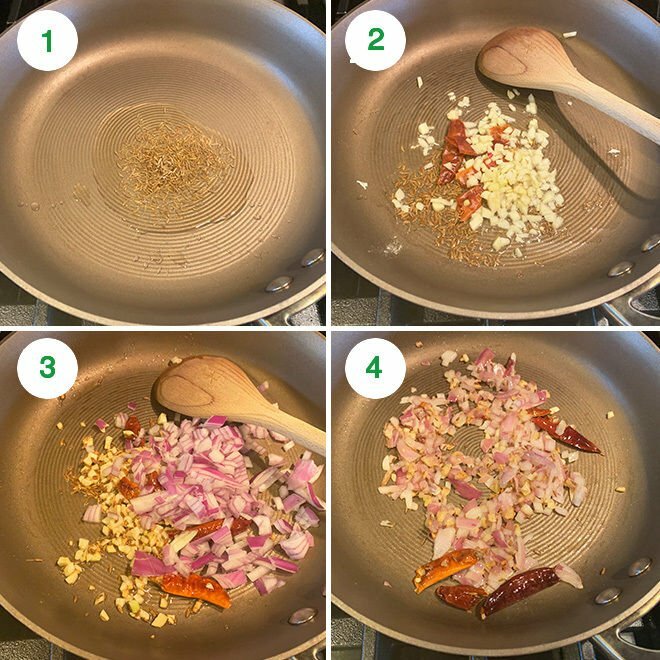 Once the oil is hot, add the cumin seeds and let them sizzle for few seconds. Then add hing, chopped garlic and dried red chilies. Break the dried red chilies before adding to the pan for more heat. Cook for 1 minutes until the garlic starts changing color. Then add the chopped onion. Cook the onion for around 3 minutes until soft and translucent. Stir in the chopped potatoes and mix. Add turmeric, coriander, red chili powder, salt along with 3 tablespoons water. Toss to combine until all the potatoes are well coated with the masala. Close the pan with a lid and let potatoes cook for 6 to 7 minutes until almost done on medium heat. Open lid and stir every 2 minutes or so. Start adding the chopped spinach slowly. Stir after each addition until the leaves. wilt. Cook for 3 to 4 minutes after adding all the spinach. Add garam masala and mix. You may skip the garam masala here if you want to keep it super simple. Squeeze in lemon juice and mix. There shouldn’t be any water left at this point. 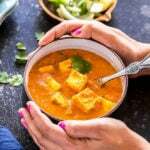 To make this recipe gluten-free, skip the hing (asafoetida) or use a gluten-free asafoetida. This recipe is loaded with spinach, if you want less of it, you can definitely cut the spinach in half. yumm!! 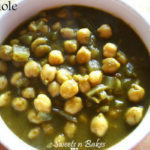 Love spinach curries! Delicious pictures, Manali! loving it! Thank you Savita, I love spinach too! We actually made this the other day. It’s a great way to use up spinach. yes it is! Thanks Dannii! These potatoes look fantastic! Such a great idea to add in spinach. Gives it a great flavor and pretty color, Manali! I would never think to add spinach to potatoes but I love the idea! This looks and sounds so tasty!! Manali I am loving this way of making aloo palak! Wish I had this with fresh chapatis for lunch today! Pinned! yeah this is one of my favorite versions! easy and tasty! Love this combination of spinach and potatoes! It sounds so easy and looks so flavorful and delicious! It is easy! Thanks Kelly! I enjoy palak aalo with rotis.. This looks absolutely delicious! Yumm! Oh man Manali!! I am so craving this! 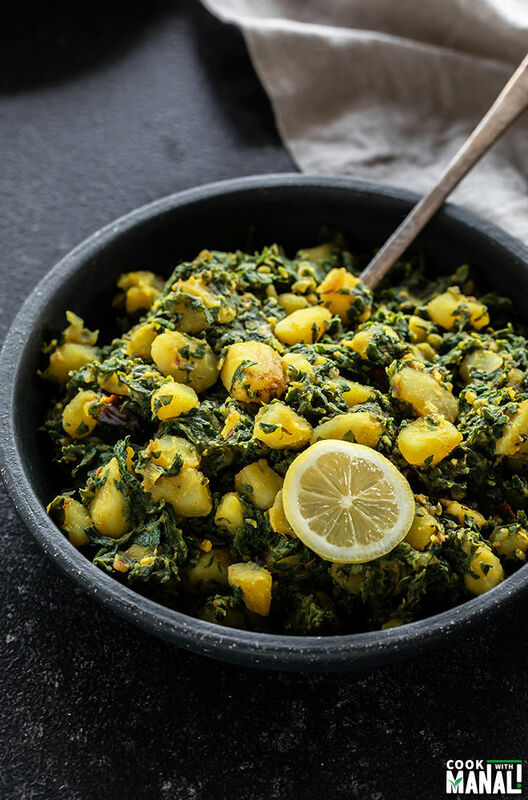 I love anything aloo and add some spinach…Yum! I’m gonna try this out this weekend for sure! Pinned! I love this dish, Manali! Those crispy potatoes with the spinach and all those warm spices sounds fantastic! Ooooh yum! This looks like it would be the PERFECT, yummy breakfast 😉 Looks incredibly flavorful! Thanks for this super yummy share! this looks so delicious! so whish I had this for dinner tonight! 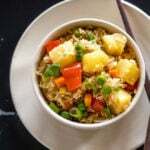 This sounds like a super easy and super awesome summer side dish, Manali! I’m loving all of the spices you’ve got in there, too! Thanks David, it’s indeed easy and delicious! Love spinach and potatoes! Looks awesome Manali! Love this dish! I love that the potatoes are the star, and it’s almost like, “garnished” with the spinach. Thanks Karishma! everyone loves potatoes! Thanks Neli! Who doesn’t love potatoes! Thanks Rachna! it’s simple and nice! This is one of my favourites to whip up when I’m in a hurry..simple, quick and tastes out of the world…yours looks awesome!! I know so easy and good!! Thanks dear! Hi Manali ! 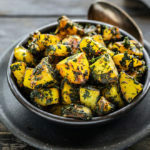 I tried this aloo palak recipe and it turned out fabulous – it was midly spiced, easy to prepare and above all comforting and absolutely delicious . I did make a small change though – instead of using regular spinach I used kailan ( baby Chinese spinach) as I didn’t have regular palak on hand. Thanks for the wonderful recipe😊. Welcome Shabana, glad you all enjoyed it!